Athena is the CEO & founder of HiredScore, an Artificial Intelligence HR tech company powering the Fortune 500. 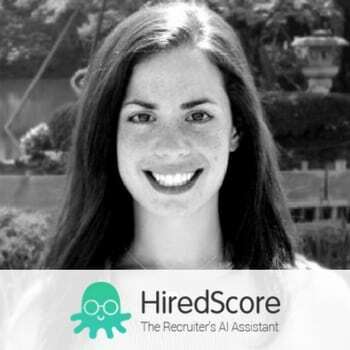 HiredScore leverages the power of data and machine learning to drive deep recruitment process efficiencies, enhance talent mobility, and help organizations move to a fully optimized TA function. Prior to founding HiredScore, Athena was an investor in NYC, most recently at Altaris Capital, where she managed and sourced investments in highly regulated data environments. Prior to that, she was an investment banker at Bank of America Merrill Lynch, focused on public technology & media companies. Athena serves on the board of Community Education Alliance of West Philadelphia, a network of Charter Schools with +800 disadvantaged students, focused on preparing youth for the workforce and a successful life. She founded Belmont Sprouts, which builds urban gardens and healthy eating experiences. She is a member of the World Economic Forum’s Global Shapers and Thousand Network. Athena received a B.S. from Georgetown University’s School of Foreign Service.